• For temporary installation in track ballast. 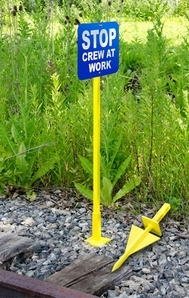 • Sign holder is 1" sq. steel tube, 48" long, drilled for 12"x15" OSHA blue flag signs. • Hammer the sharp 12" long spear point into the ground using the included hammer punch. • To remove, strike square socket with hammer and pull spear base out. • Sign plate not included.